FishEaters Traditional Catholic Forums - Pope: The "gay lobby" is mentioned, and it is true! FishEaters Traditional Catholic Forums > Church > Catholicism > Pope: The "gay lobby" is mentioned, and it is true! Full Version: Pope: The "gay lobby" is mentioned, and it is true! Might_4_Right Wrote: Looks like the Holy Father may have a difficult road ahead of him. Pope to CLAR, part 2: "Yes, there is a 'gay lobby' in the Curia. We need to see what we can do about it"
Among many other things said by His Holiness in his audience to the Presiding Board of CLAR (the Latin American and Caribbean Confederation of Religious Men and Women - Confederación Latinoamericana y Caribeña de Religiosos y Religiosas) on June 6, 2013, according to the transcript provided by those present to Chilean ultra-progressive website Reflexión y Liberación (Reflection and Liberation), was a reference to a supposed "gay lobby" inside the Roman Curia. Just a note: the words below, not at all happy from a progressive perspective, are a strong indication of the likeliness that the transcript is accurate - or as accurate as it is possible in the setting of a non-public audience. God bless the Holy Father for having the guts to say something like that. He's in for one tough fight, that's for sure. It is quite interesting that the pope himself admits that he cannot do the reform himself because he is so disorganized. 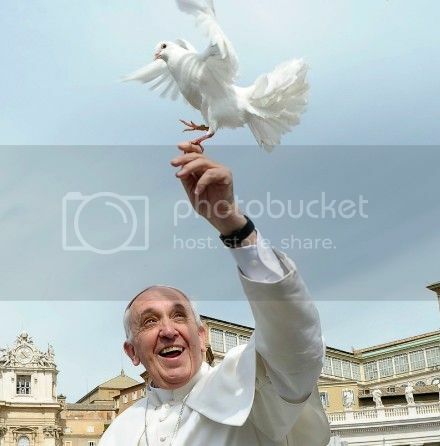 This is the reason no one expected him to be elected, everybody thought that a pope with strong administrative skills was needed, even many Cardinals said so. That means that those Cardinals who want a weak curia won. Unfortunately, the Cardinals to whom he has entrusted the reform also want a weak curia. Cardinal Marx of Munich has said in interviews that Rome should stop behaving like an emperor's court and stop meddling in affairs of the German Church. The goal of this reform will be to strip Rome of all power still left and shift the power to the bishop's conferences. Let's pray the Holy Ghost guides him. Perhaps an unorganized Pope will do what the organized, disciplined, and scholarly ones have all failed to do concerning reform. Fr Luigi Villa, Fr Malachi Martin, Randy Engel, Franco Bellegrandi, were unanimous in pointing to the pontificate of Paul VI for the installation of the gay mafia in the Vatican. What a pope complacently didn't oppose, let's hope another pope will uproot it mercylessly. Francis continually surprises me. Just when I think he is't going to do anything, he speaks out against the gay mafia. On the other hand, he says he is disorganized. So is the Curia just supposed to fix itself willy-nilly? Also, how we would love to read what Benedict wrote in the Vatileaks dossier about the Curia corruption. I hope Francis takes up the advice of his venerable predecessor. I still don't know how to peg Francis. Time will tell. The real deal is if Pope Francis releases the remainder of the Secret of Fatima, and Consecrates Russia, the Peace which Our Lady promised will Fix this. There is no human Fix, there is so, so, so, so, much more than the Gay Mafia. You all know the drill the Church is infiltrated by Commies, Masons, Modernists, and the faithful are poisoned in every way you can think, and that means us too. Fr M. Martin that was an advisor to Pope John XXIII. and knew the secret, said when it is released the Churches will be full with people beating their breasts. That means all of us too. Our only weapon is following exactly what Our Lady said for us to do at Fatima. In a very strange way the Lord God Almighty is allowing this to go on, so, in the end when the Immaculate Heart of Mary will be placed next to His Son's Sacred Heart, none of us down here will be able deny it was She, and will not be able to say it was done otherwise. I'm not saying we shouldn't work to fix it, but the repair is not ours. We do what was asked at Fatima and God will give us Graces we do not deserve in Our Lady's name. God uses the Saints to give us Graces He wishes, and works through them, so we do not get swell heads, and in an odd way this is all about having swell heads and the sin of Pride.